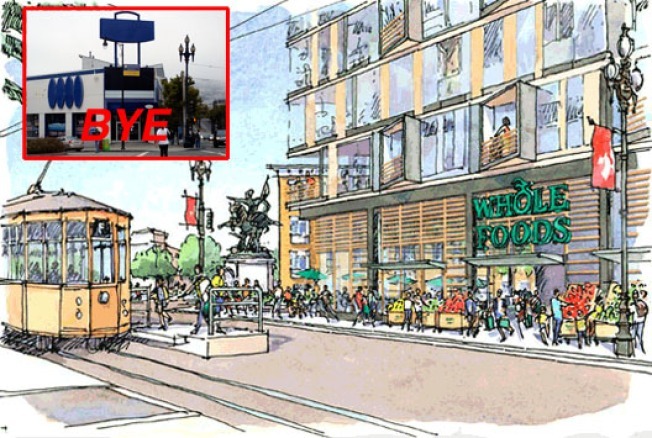 A rendering of what the Whole Foods in the Castro will look like. Happily, we have some renderporn straight from the developer to make up for it. As has been pointed out before, the project's being led by the Prado Group, with renowned green architects William McDonough + Partners. The building will be broken up into three sections: a 45-foot-tall section by 14th Street and 85-foot sections by Market and Dolores each. Also: a landscaped sidewalk along Dolores, and outdoor seating along Market with balconies above. Residences: studios, one- and two-bedrooms, with 15 percent affordable. The neighborhood officially OD's on gro-stos in: 2011. P.S. That's three Whole Foodses on their way: Haight/Stanyan, Market/24th, and Market/Dolores. Woohoo?